The history of the Killarney Show Society reflects the culture, fortunes and interests of the town of Killarney and its people over more than a century. On February 6th 1907, The Warwick Examiner and Times reported the formation of the Killarney Agricultural Society. “At a public meeting of residents last week an Agricultural Society was successfully founded. Mr RA Howell, has agreed to allow the first show to be held on his property at South Killarney and to give the use of the Central Hall also. Mr WT Neill, auctioneer, has also placed his saleyards at the disposal of the society for stock exhibits. After initially being leased from R A Howell, the Killarney Showgrounds were bought by the Show Society for 300 pound in 1908. Killarney Show & Rodeo Society remains one of the few Queensland show societies to own their own grounds. By 1911, the Border Record recorded the following events for Killarney’s Show held on Wednesday 6 and Thursday 7 of February -hackneys, stock sales, parade of hacks, trotters, and all classes of horses and cattle, log chopping and cattle drafting. Admission was 1 shilling, with children 6 pence, and members free. Non-members paid 1 shilling for each vehicle and 6 pence for each saddle horse. A special Show train ran from Warwick to Killarney. The fortunes were not always fair – the minutes of a 1923 Show Committee meeting refer to trespassers on the grounds, locks being broken and discussions of moving the show date to April. Show commentary from the Border Record of March 1926 reflected on the reduced showing in the produce section of the pavilion and the changing fortunes of fodder growers as the motor car replaced the horse. The author referred to Mr Barnes’ opening address – “the farmer may have to turn his crops into vegetable oil to provide fuel for motor cars”. Killarney is described as a wheat growing and pig farming district – and these exhibits were underrepresented. 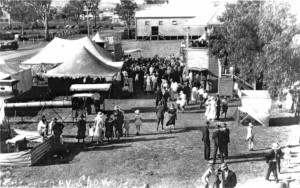 In the 1930s the Show was the social event of the year, the results of the show were reported in the Brisbane papers and excited correspondents wrote letters to advise of friends and family’s success at the show. For ladies a new outfit, frock and hat, were a must and the advertisements in the Border Record reminded ladies it was never too late to consider show wear. The high covered grandstand and publican’s booth built in 1912 dominate early photos, where the background to Kurrajong St shows no houses. This building was destroyed in the 1940’s. The current bar and announcers booth were built in the early eighties, replacing wooden buildings around the edge of the grounds. The soda pop stand and wooden bar still remain. During the war years, no shows were held and the showgrounds fell into disrepair. The newly formed Killarney and District Sports Club offered a generous amount of 30 pound for repairs so they could hold a rodeo. The first rodeo was held in the show ring on New Year’s Day 1945. Up to the 1950’s horse high jumping was a popular attraction, with a record of 7 feet 4 inches (2.2 metres) being held for 15 years. The hunts, where horses were judged on style and ability over jumps, were also a popular event. In the 1950’s the Junior Farmers Club always mounted a fine display of produce grown in the district. Trots and Pony Races were also a key attraction. Trotting remained popular until the 1980’s when new rules meant the show ring was too small. In 1955, Patron OO Madsen referred to the high standard of dairy stock in the livestock section and increasing interest in the beef section. He also writes of the new pavilion and supper hall. A call for financial assistance saw many of the Killarney community join the society as Life Members. There were 63 life members in 1955. The Show Committee was very robust – the President of the committee often acting as the unofficial mayor of the town. It is said at one point there was a waiting list to join the committee! The weather, of all extremes, has always been a challenge to the Killarney Show, with the show dates moving from January, to March, April and February to try to find a more temperate season. The season’s rain, or lack thereof, reflects in entries in all sections and each year’s newspaper reports refer to the weather and its affects. The Show Ball and the concurrent Miss Showgirl quest have been keenly supported by the young women of the Killarney since the 1960’s – with the best and brightest competing for the honours of the sash and tiara. Thousands of dollars have been raised for the society by the quest. The Showgrounds did not avoid the terrible damage wreaked by the tornado in November 1968; the pavilion was blown away with only the floor remaining. The supper room lost its roof. After debate over the limits of insurance the policy paid out to cover the building. The current pavilion was built on the existing floor and opened on 3 April 1970. Three blocks of land along Acacia St where buildings had been destroyed became the current rodeo grounds. Over the years the grounds have been used many times to raise money for community projects and individual community members in need. The role of the Ladies Auxiliary during the 1970’s has always been spoken of with some awe. They catered many local weddings, the Deb of the Year ball, clearing sales and the show itself. Their fundraising helped fund many improvements to the facilities and grounds. A popular feature of the Killarney Show during the 1980’s was the Wickham’s Bullock Team, driven by Eric Reis. The challenge of bullock team vs semi-trailer was a great spectacle. During this time Horse Driving events regained popularity and the show-jumping was held on Saturday evening under lights in the Rodeo Arena. The 1990’s was a great period of updating facilities – the showgrounds were fenced with the assistance of prisoners who had assisted with the clean up after the Charleville floods, a new show arena was built and the rodeo yards were rebuilt. The Smash Up Derby was introduced to become one of the most popular events of the modern evening programme and a Stud Cattle competition was reintroduced. In the 2000’s a changing culture has put great pressure on the volunteer committee. The outbreak of Equine Influenza caused the Show Society to cancel the 2008 show – though the Dog Show, Cattle Dog Trials and Show Ball were still held. The closure of the town’s major employer, Killarney Abattoir, and the northern mining boom have affected the fortunes of Killarney – the final effect on the Killarney Show remains to be seen.